Our bonsai pots are selected from kilns in Japan and China, and include a growing number of hand crafted one-of-a-kind pots by American artists. Bonsai pots come in all sizes and shapes. Pairing the pot with the tree takes time! Having the right pot is essential, and finding the perfect one for your tree is always an exciting treasure hunt. The Japanese have given us traditional rules for pairing pots with trees. While we love breaking rules, it’s good to know the established basics: the height to trunk ratio, depth of pot, whether glazed or unglazed, as well as keeping the visual weight of the pot in balance with the tree. As always, the tree’s health is most important! Bonsai are developed over years to be able to survive in smaller pots, but you must always keep in mind the actual measurements of your tree and choose a pot that is deep enough to promote vigorous growth. When purchasing a pot consider bringing your tree in for a second opinion. 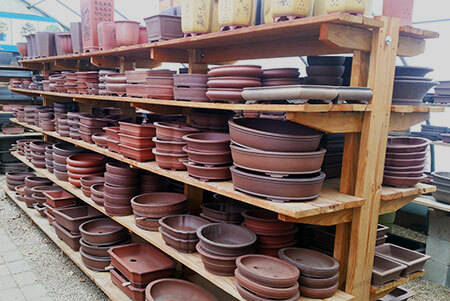 We are experts in picking pots!